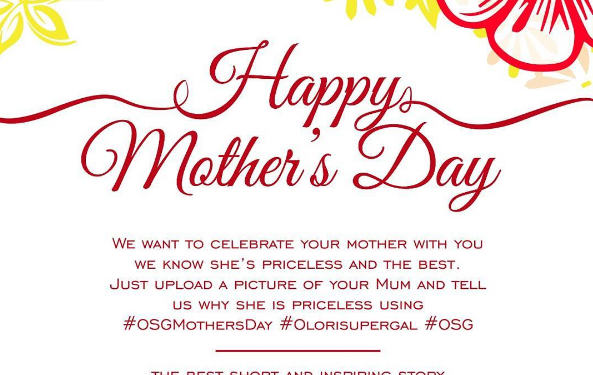 Yetunde Salimon has emerged the winner of #OSGMothersDay contest, as celebrated last Sunday (26th March). Yetunde won with her bonding photo taken with Mom, captioned by her priceless messages for her. Please do not my let death MURDER my MOTHER! My LAWYER , SENIOR ABIYAMO of NIGERIA , she advocates and solicits for me every where, every time without getting paid … My SPECIAL ALARM CLOCK, that jeers me up to be early to every activity and important event in life… My heavenly IBRUPROFEN tablet, always bringing relief to my pains and worries… My golden LUCOZADE BOOST, always giving me energy and motivation each time I’m down… My SOLDIER WOMAN and DAME IN A SHINING ARMOUR, she has fought and conquered every Boko Haram and ISIS member in my life… My own personal PRAYER WARRIOR, her prayers keep me going… She’s definitely the best thing that has ever happened to me in life! Without God and her, I wouldn’t be here today. I pray she lives long to reap the fruits of her labour…she truly deserves it!